Imagine how much dog poo winds up being improperly disposed of each year. It certainly would be in the millions of tonnes. Until relatively recently, dog poop wasn’t considered a huge biological hazard, except for in rare cases causing a disease called Toxicarias. Scientists are have been reconsidering that notion after having made disturbing discoveries such as bacteria levels being so high at some beaches that people have to stay out of the water. One of the culprits that has been found to significantly raise the bacteria levels is dog poop. It’s not just from the nuggets on the beaches, but runoff from stormwater drains after that water has come into contact with the poop. Some of the bacteria harbored in dog poo includes E. coli, salmonella and giardia. Nutrients in dog poop can also be washed into other waterways and contribute to algal blooms. Other than that, dog poo is just plain gross and pollutes our parks and sidewalks. Some people put dog poop into their worm farms, which works fine, although it’s not recommended that you then use the worm castings from the farm in your vegetable garden. General composting is also an option, but again, the compost shouldn’t be applied to your veggie patch. The other alternative aside from burying it in your garden or dumping dog poop into your bin is to consider installing a dog toilet, aka a doggy loo. These are buckets with holes in the bottom you place into the ground on a bed of stones and then add an enzyme to which will break down the poop. When the bucket is full, you simply pour water into it and the broken down materials will flush away. There’s no risk to your plants, so you can have the bucket hidden away in your garden. You can buy a doggy loo already made up or create one yourself for just a few dollars using these very simple instructions. If you can’t find a septic treatment starter they recommend on the page, even active enzyme drain cleaner will do – it just consists of the “good” bacteria needed and is available at just about any hardware store. If you get the pellets, I’d recommend about a teaspoon dissolved in a cup of water thrown in every month or so to keep the bacteria colony fresh. You can also combine a worm farm with a doggy loo – just use worms instead of enzyme starter. The worm population will adjust to the level of poop provided. If you live in an area subject to extreme temperatures (cold or heat), take this into account when choosing a location. However, composting worms are quite tolerant of a wide range of temperatures and the earth surrounding the bin can act as an insulator, while the contents will generate some heat. Most of us have seen it happen, somebody walking their dog and Fido decides to take a dump – and the owner doesn’t clean up afterwards. This nearly happened to me when I moved to my current location. It’s a tiny town and I was keen to make a good first impression with local folks. I took Niki The Wonder Dog for a walk down the street and the first thing she did was to do her business smack-bang in the middle of someone’s driveway – and I was without a bag! Thankfully the general store was just a hundred meters away where I managed to get some bags and clean up before her deposit was spotted (I hope). Many people carry plastic bags with them, which is great – but unfortunately standard plastic bags aren’t all that earth friendly and take years to break down. There are biodegradable/degradable bags on the market designed just for this purpose. Animal Management Services produces three types of 100% degradable dog waste bags that break down when subjected to light, heat and or moisture. These are somewhat different to biodegradable bags that rely on living micro-organisms to break down. According to Evan from AMS, who was kind enough to provide me with some added info and bags some years ago, their GREEN bag is starch based and will break down in landfill in approx 90 days. Their BLACK bag (pictured above) is produced with EPI additive. When exposed to sunlight or heat the additive triggers a two step degradation process, in which the plastic breaks down through oxidation into small fragments, which then biodegrade into the natural elements of carbon dioxide, water, biomass and minerals. The degrading process for the black bag is approximately one year. I’m assuming that the black bag, like most other many other plastics, is petrochemical based – so their green bag would be the one considered by many as being the more environmentally friendly option. It’s a little difficult to accurately say which is more “green” as even starch based plastics require petrochemicals along the way – plus herbicides, pesticides and other chemicals in the manufacturing process. It’s a complex area; but either option is still far better than a standard plastic bag; unless it’s one you were going to throw out anyway. While Animal Management Services supplies only to the Australian market, there are similar products available in just about every country now. 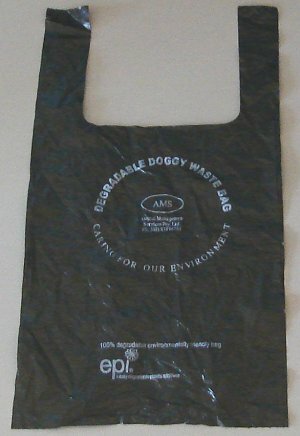 If you’re having problems locating these doggy-doo bags, also check out your local supermarket as a range of degradable/biodegradable plastic bags are now quite common in larger stores; but are just being sold for general use rather than dog waste specific. As for lasting in storage, I can say degradable bags perform well. I was provided with my bags in late 2006 and more than 6 years later, the ones I have left are still as strong as the day I got them. The key is to store them at room temperature; or as close to it as possible. A bag I left in my truck for a few months broke down into a bazillion pieces due to heat. 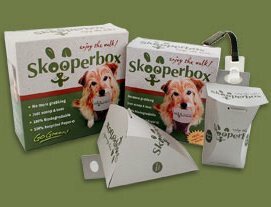 Made from 100% recycled paper, the box is flat to begin with and using the special leash clip, very convenient. When your dog does its bit whilst out on the walk, pop open the box, scoop up the poop, close the box and hang back on the leash clip ready for disposal. You can learn more about SkooperBox here (USA).